A binagoongan is simply a dish quite famous in the Philippines, with “bagoong” as an important ingredient. A bagoong is a condiment made from fermented fish or shrimp fry preserved in salt. For those unfamiliar, the smell can be repulsive and the salty taste too much. Therefore, consuming bagoong or any binagoongan dish is an acquired taste, and therefore not for everyone. 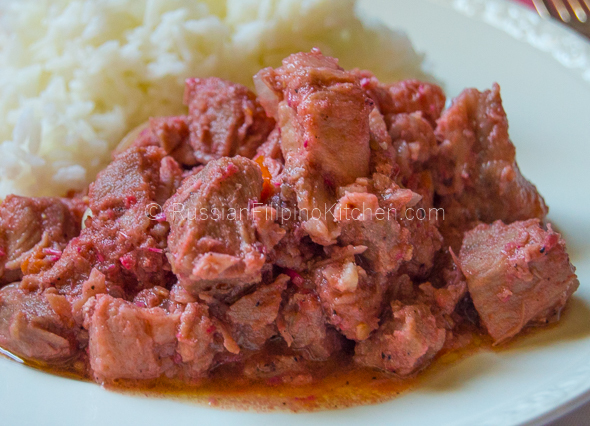 This recipe is for pork with bagoong or known as binagoongang baboy in Tagalog. There are different variations of the recipe, but this is the basic. The meat is first simmered until very tender, then sautéed with garlic and onions. Hot peppers are added for that extra kick, and then mixed with bagoong alamang and seasoned to taste. Since this is a salty dish, it’s best paired with plain white boiled rice. Enjoy! 1. In a big pot or wok, place pork chunks, water, vinegar, and ½ tsp salt and bring to a boil. Lower the heat and simmer for an hour until pork is tender and the water has dried out. 2. While waiting for the meat to get soft, chop tomato and set aside. 3. Also, peel the onion and chop, then peel garlic cloves and mince. 4. When pork has softened and the water has evaporated, let the fat from meat come out on its own. Throw in garlic and onions and sauté until browned a little and garlic is translucent, about 2-3 minutes. 5. Add chopped tomatoes and sauté till they shrink. 6. Throw in the bagoong and sauté for another 5 minutes. 7. Add the chilies (I used dry pepper flakes and just added a pinch) and ground black pepper. Cook for another 5 minutes until most of the liquid has dried out. 8. Serve with hot boiled rice.